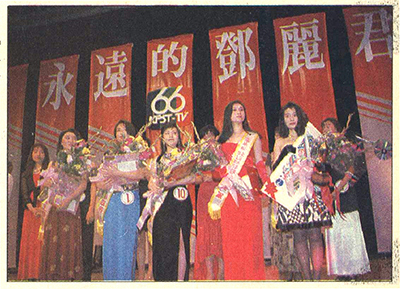 In June of 1995, CTS TV station of Taiwan, commemorating Teresa Teng, initiated a special singing contest, uniting / inviting TV stations from Hong Kong, Singapore and United States in the “Forever Teresa Teng Singing Contest”. 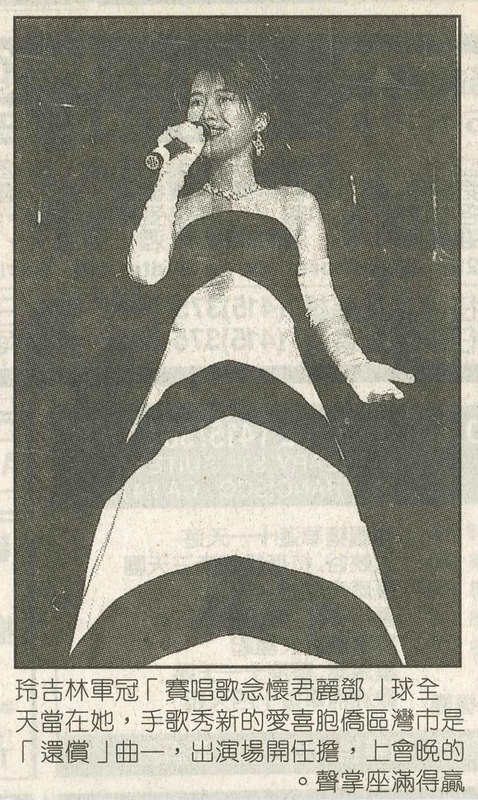 I participated in the United States’ competition, competing against singers from all over the United States and Canada and eventually won the title. 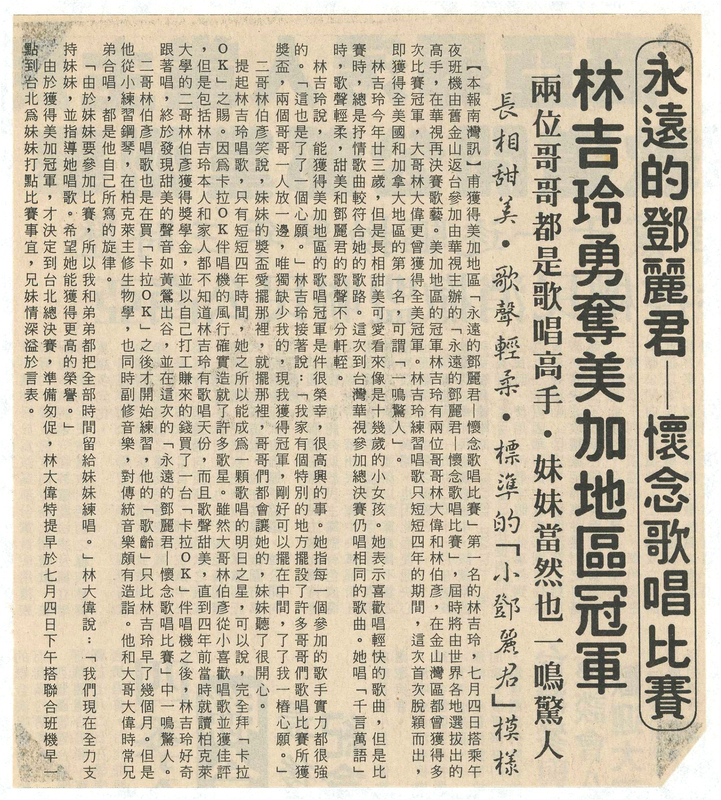 After the US final, two of the top finalists were sent to Taiwan for the finale competing for the world title, for which I was fortunate to win the title as well. 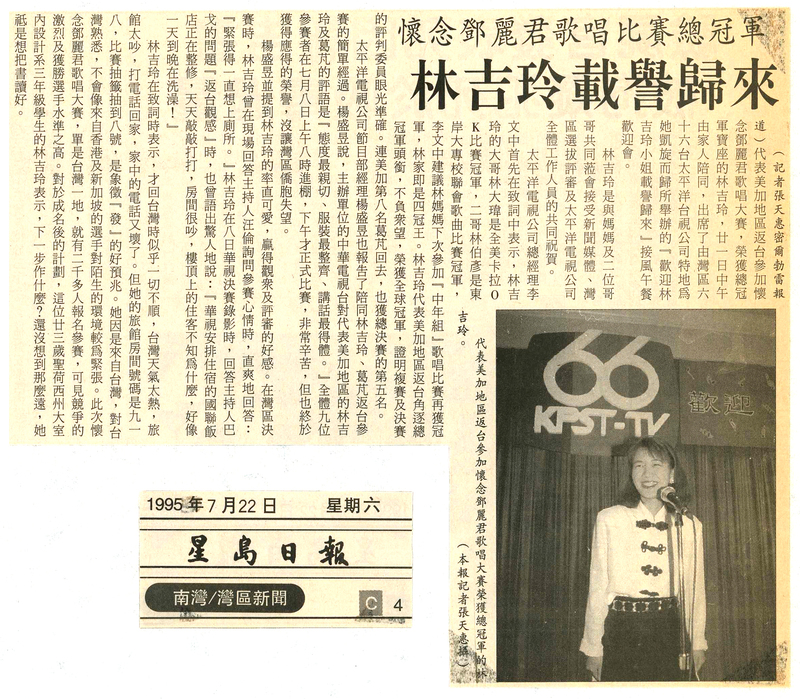 I have competed in numerious competitions, this was the first compeition that specialized in Teresa Teng's song. It was a firece competition since there is no limitation for professionals to join and there were people coming from all over the U.S. and Canada. I was humble by the experience and felt lucky that I could win. We flew to Taipei for the World FInal. 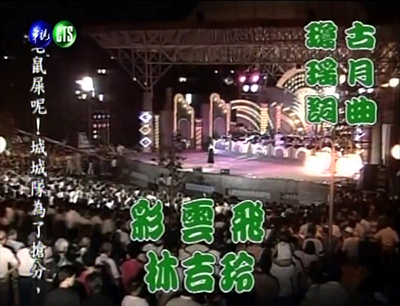 It was as competitve since there was another contestant who was imiatating Teresa Teng. Luckily, I was able to win based on techniques and of my mood expressiveness. 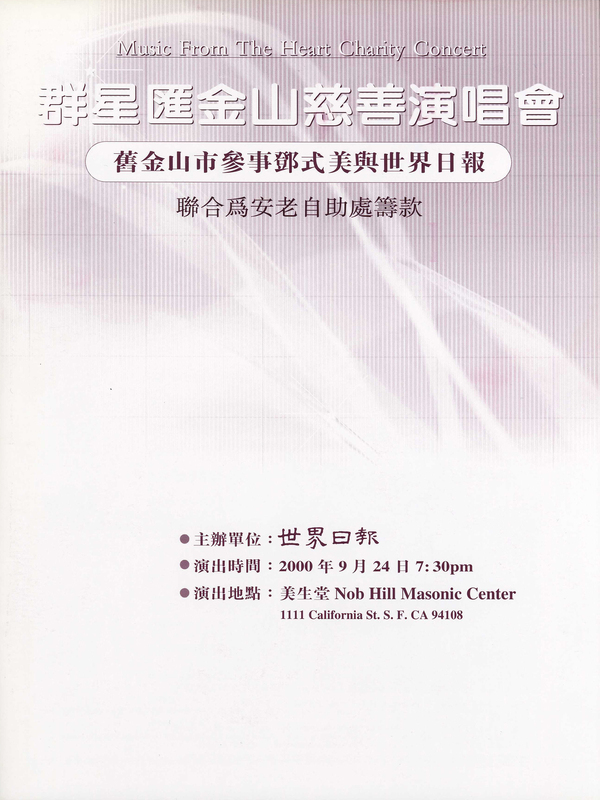 After the competitions, I was invited to sing with other popular singers from Taiwan to celebrate World Journal, San Francisco branch’s event, in celebration of 20th anniversary since their debut issue. I also attended Teresa Teng’s Memorial Concert, appearances in several Golden Melody programs, live concerts and other events. My brother and I were both invited to perform at this concert. He happens to be the First place winner at World Journal's First U.S. singing competition the previous year. I was the opening act for this event. 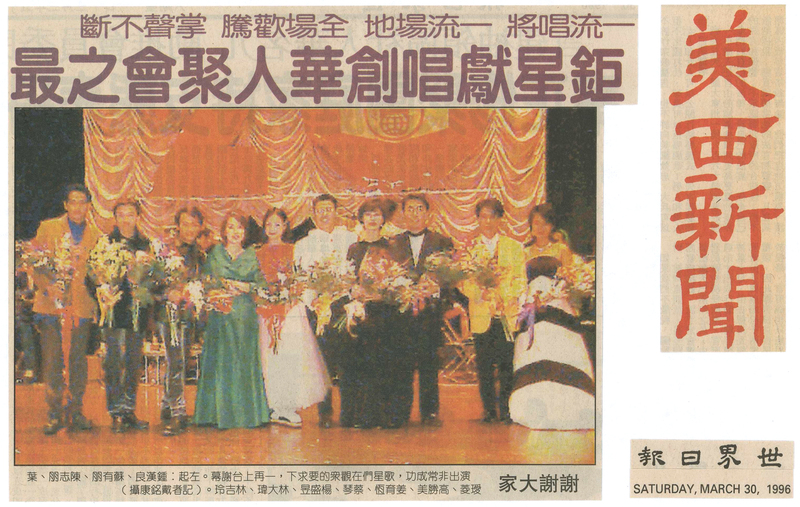 I performed in front of Teresa Teng's mother. Originally, I wanted to sing Mother's Heart, even though a less known song by Teresa; however talks about struggles as foreigner, how the missing thoughts of mothers gives them warmth and strength and how they cant wait to be united with their mom. This sound has great meaning for myself and Teresa as we are both foreigners and can relate. Also, the program was going to air on Mother's day, I thought it would be really meaningful to perform this song in her presence. Periodically Golden Melody will do live concert recording. 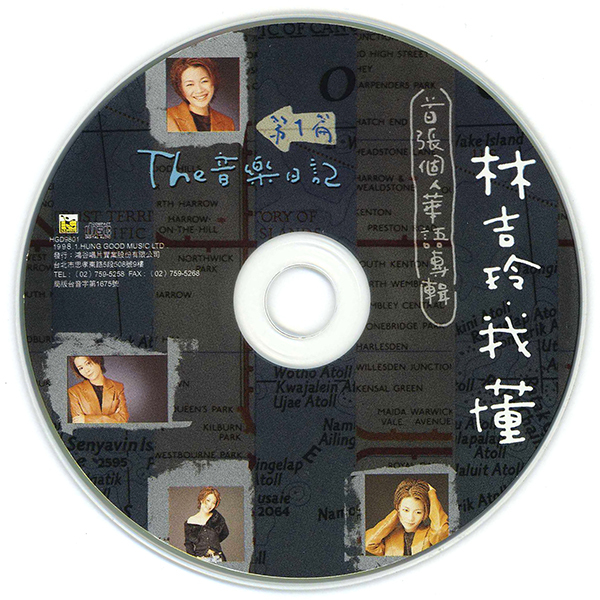 I was invited to sing Teresa Teng's song with a female Taiwanese folk singer. I was invited numerious times to sing at Golden Melody program. 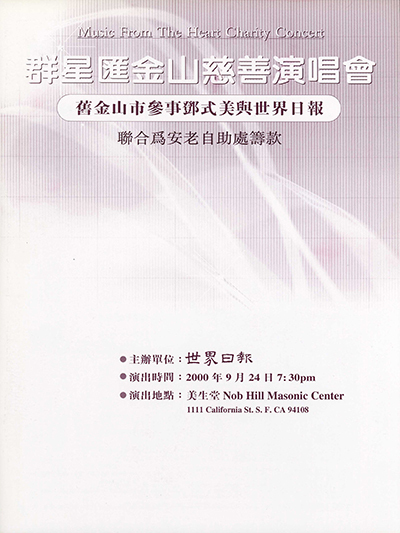 The program was known to invite artists to sing the classics with live band. 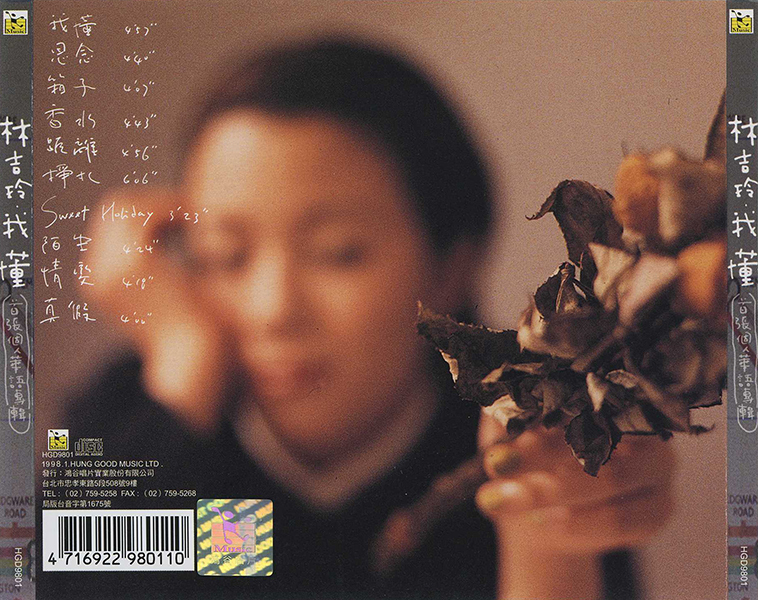 In 1998, I debuted my first album, titled: I understand, which reflect on understanding and missing of loss of the loved one. Even Though, there wasn’t fancy outfit or elaborate packaging, I carried the album with moving emotion sincerely. I was also invited to sing “Melancholy”,a song soundtrack created for a historical drama - Yongzheng Emperor. 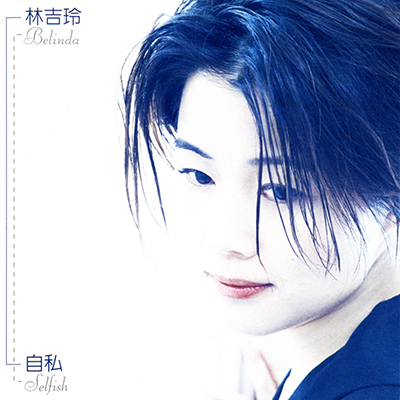 Even though it gained favorable recognition and was popular among the viewers, it was not included in my second album - Selfish. Yongzheng Emperor's screen writer and song lyrist invited me to sing the end credit for this historical drama. I was gratful for the opportunity and happy that this song was well received. In the recent years, after moving back to the states, I attended performances locally and throughout the US and sometimes overseas to perform for compatriots in cities like Amsterdam, Paris, Brussels, Dusseldorf, Berlin, Hamburg, Munich, Frankfurt, San Juan, Panama City, Sao Paolo, Rio de Janeiro, Brasilia, Guatemala City, Mauritius Island, Cape Town, Johannesburg, Durban.. Last year, I was invited to guest star at Forever Teresa Teng Memorial Concert at Planet Hollywood in Las Vegas. 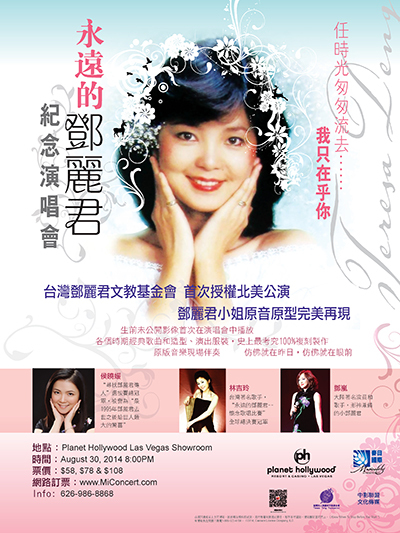 Earlier this year, I was invited to perform Teresa Teng’s songs at Harrah's Lake Tahoe Hotel and Casino. Later this year, I was invited to guest star at William So Autumn Moon Concert series at Pechanga Casino & Resort and Cache Creek Casino & Resort. 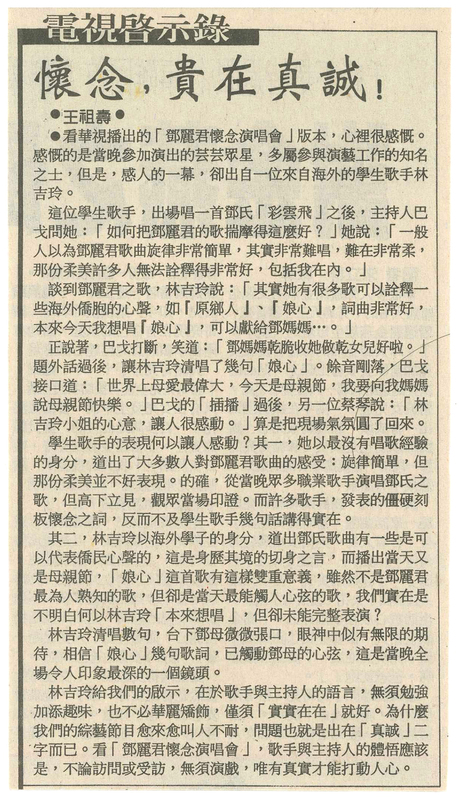 In these events, I performed Teresa Teng’s well known songs, even though not imitating, but I’d like to use these familiar melodies, hoping to recall people’s memories, commemorate our forever superstar - Teresa Teng. I was the opening act for this event. I was invited to be the feature singer at the Thanksgiving Concert. 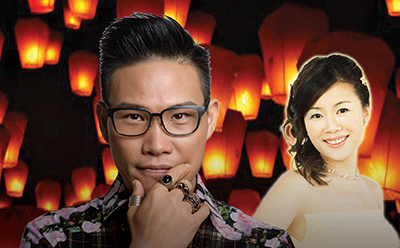 In 2014, I was one of the three singers to perform at Forever Teresa Teng Memorial Concert. 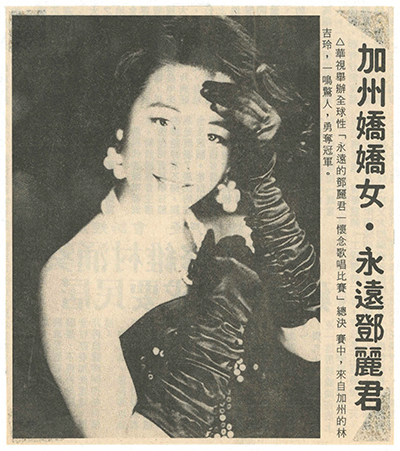 That was the first offical concert approved and authorized by Teresa Teng's foundation. 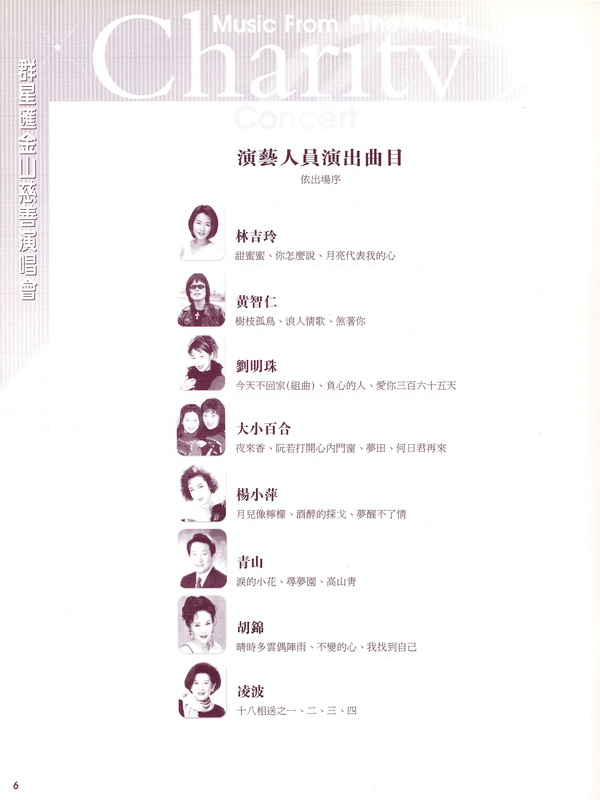 In 2015, appearing as special guest for William So's Autumn Moon Concert performing Teresa Teng's songs.